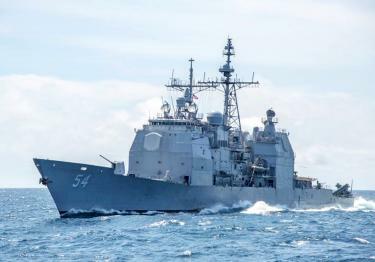 The USS Antietam, a US Navy guided-missile cruiser that passed through the Taiwan Strait on Monday, is pictured in an undated photograph. The Ministry of National Defense on Monday evening confirmed that two US warships had sailed through the Taiwan Strait with a northerly bearing, after entering the channel from the seas near Oluanpi (鵝鑾鼻). Premier William Lai (賴清德) yesterday said Taiwan respects the US’ right to exercise freedom of navigation in international seas, after a reporter asked at a Legislative Yuan news conference whether the US gave prior notification to Taiwan of the activity. The US sailed warships through the Strait 10 times in 2015 alone, he added. The passage of the two warships through the Strait was the second time since July, a show of US force that threatens to further exacerbate tensions between China and the rest of the region. China expressed their disquiet to the US after a similar transit by two US warships in July. Tensions have also risen ahead of the nine-in-one local elections next month. Taiwan late on Monday requested that China refrain from interfering in its elections, saying that Beijing should respect and learn from its democracy.